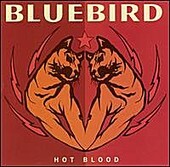 Crunchy, guitar-driven rock that would not be out of place on commercial radio, Bluebird's slick-produced Hot Blood still retains a certain amount of street sound, preferring to keep things relatively straight forward (very little overdubs), helping to keep the songs sounding lively and fresh. The music comes flying at you from every angle, sounding heavy and loud, but shining with a glimmer of melodic punch that helps the songs bubble as they boil. I'll give it a C+.